This is my first time trying out a raised garden! I need all the help in this layout that I can get…. I have grown traditional row gardens before, so I am questionable with my typical crops in the square foot garden. I plan to trellis my tomatoes using the single stem method to add a little control to my vinage (indeterminate of course). 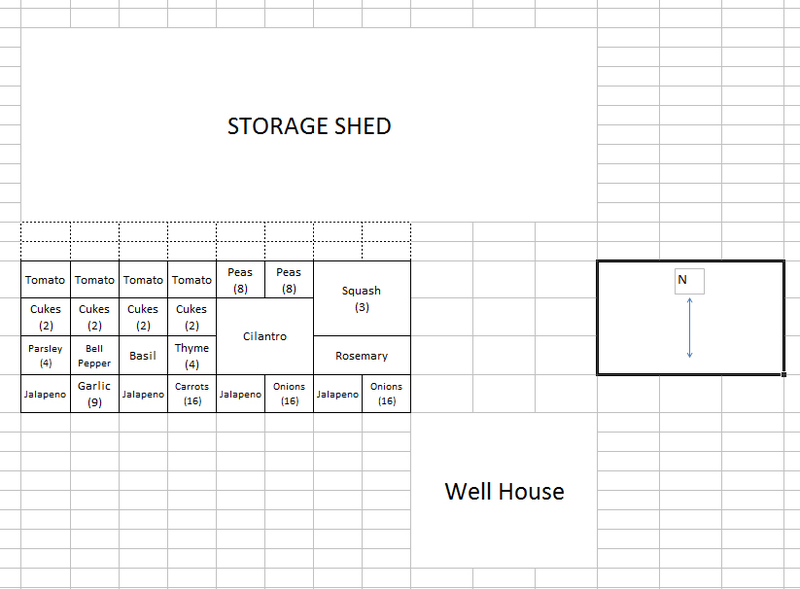 I also plan to trellis the peas and squash….still undecided on the type of peas I want this year. Im thinking I may have too many cukes lined up on this garden plan, but as all sources suggest, the spacing is fine….need input though. Also, I do not plan to put down a weed mesh bc of the 8 inch depth of my cinder blocks. I plan to have a variety of peppers (jalapeno, bell, banana, and maybe chili)…wasn’t quite sure on the placements. My biggest question is how well the herbs will grow in this Louisiana weather, as I have never tried herbs. I am planting mostly for salsa, marinade, and pickles…as that is what we love to consume in this family. My peas and squash crops will hopefully yield plentiful side dishes. I also plan for a nice lettuce, spinach, and chard (Hardiness Zone willing) crop in the Fall…but of course that is not reflected on this garden plan. Anxious to hear comments and revision suggestions!!! The 4 squares I was leaving open for one Cilantro plant. I should have clarified that. I will try the Basil closer to the Tomatoes. I have pulled Rosemary, Thyme, and Parsley from my garden plan so far. I have my Tomatoes, Jalapeno’s and Bell Peppers ready to transplant, just waiting on the rain to stop so I can construct my garden! I have yet to plant my Cukes or Squash seeds, and I worry that I might be too late 🙁 We shall see. My daughter and I sprouted a good many Black-Eyed Pea seeds, and they have been growing so well. They are ready for transplant. To add to Elizabeths “why so much cilantro”: Cilantro grows like a weed, two plants, even for the avid cilantro fan would be overwhelming. I would also move basil over by the tomatos as they are companion plants, and the flavours of both the basil and tomato become richer. Basil will be more prolific as well. My potted basil never does as well as the basil planted with the tomatoes. Herbs are by far the easiest thing to grow. Most of them love sun and hate wind. So I don’t think you’ll have any worries at all once they are in the ground. Small recommendation, plant nasturtiums. Every part of it is edible (petals are peppery, seeds are like capers), they taste delightful in salads or on tomatoes but the best part? Bugs will attack them before your tomatoes. I would have had a white butterfly/caterpillar problem but they left my whole garden alone and feasted on the nasturtiums. I was worried that the buggars would kill off the nasturtiums but they bounced back and were glorious once again like it had never happened. I simply used the Microsoft Excel program. I have seen some interesting ones on this site that are way more detailed than mine. I hope I can find the program that they use. Love your plan. hat program did you use to create your plan? I agree with Elizabeth’s suggestions. Also … I have a cinderblock raised bed garden (4th year), and I highly recommend that you put several layers of newspaper or brown paper grocery bags (or landscape cloth) underneath before adding the dirt because grasses and weeds still do try to poke up through the inches of soil initially. If you have room, rather than trellising your squash, I would let the vines fall over the side of the bed and out into the yard, if you can. They do very well and it looks great. Sometimes trellised squash get too heavy and break the vines. I did this last year, and the vines wandered all over my garden and it looked really good. Here’s a link to pics of mine. I plant nasturtiums in the holes of the cinderblocks around the edge, and they fall down and cover them, which is very nice. Good luck with your garden! Rosemary is going to keep growing. Plant it in a permanent spot in your yard. Keep trimming it like a hedge! Herbs will do very well in your climate. However, your cucumbers need a trellis. They need to go on the North side of your garden. Maybe plant tomato, cuke, tomato, cuke on the back row. I would only have one pepper plant of each kind as they produce like gangbusters and you will be begging people to take them off your hands. They will get about 2 feet high, so placement near the middle is better. Keep some space between pepper plants so they don’t cross breed. Once it gets hot, your pepper plants will stop producing. Once it cools down again, they will get their second wind. Why such a big area for your cilantro? Once it gets hot, it will die. I would suggest just one square for cilantro. Good placement for your squash. It will take over that whole corner. I would just plant two near the edge.